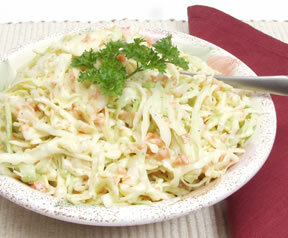 Coleslaw, especially the pickled variety, is often served with Southwestern foods. You can tuck it in tacos and burritos and enjoy it as a side dish with spicy entrees such as enchiladas. This particular slaw is a wonderful “take-along” for campers and picnickers because it keeps very well without refrigeration. The story goes that it keeps for 9 days, but I’ve never had any last that long! Heat the oil, vinegar, sugar and celery seeds until the mixture boils and the sugar dissolves. Simmer for a few minutes. Combine the chopped vegetables in a large bowl. Season with the salt and pepper and mix well. Pour hot dressing over the vegetables and let stand for at least 2 hours before serving. Better yet, chill overnight for the best flavor.